At our dental practice in O'Fallon, we understand the unique smile needs that patients face through each stage of life. Dr. Schwarz and our team of dental professionals are qualified and equipped to meet those needs with unsurpassed patient care. While the health of your teeth and gums are of primary importance, we also value the benefits of an attractive smile. With our expertise in general, restorative and cosmetic dentistry, we can ensure your smile retains both function and aesthetics for years to come. It will not take long for you to discover the unique dental experience at Riverheart Family Dentistry. We have a friendly and compassionate staff to welcome you, and our office environment features the appealing comforts of home, including a beverage bar, TVs, a children's play area, warm blankets and more. We proudly adopt the latest in dental technology, which means that you can enjoy dental procedures that are faster, more comfortable and safer than ever before. For patients that experience anxiety or fear, we also offer sedation dentistry to secure a pain-free experience. 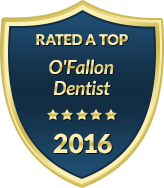 To learn more about O'Fallon's best dental practice, please contact us today. We are always happy to answer your questions about our practice, our team or the comprehensive dental services we offer at Riverheart Family Dentistry.